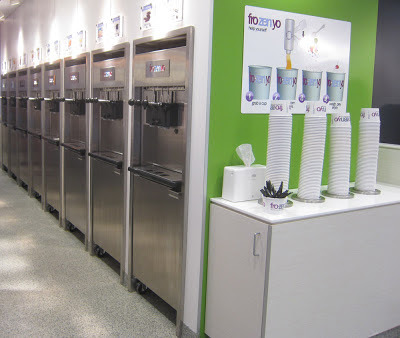 A FroZenYo frozen yogurt shop has opened at 1735 N. Lynn St. in Rosslyn. The shop is about 100 feet towards Key Bridge from the entrance to Chipotle at the intersection of Lynn & Wilson. It's easy to miss because it doesn't have a prominent sign. Hours of operation are Monday-Thursday, 7am to 10pm; Friday, 7am to 11pm; Saturday, 8am to 11pm; and Sunday, 8am to 9pm. Frozen yogurt is another good reason to take a walk downtown Rosslyn.